My students and I are doing a project-based learning activity on health for the next few weeks. Last week, they watched a video discussing various habits they might consider adding to their routine in order that they can become more healthy. We decided to research three areas: nutrition, exercise and healthy habits. Their culminating activity will be to create a brochure that we can put into any gym or doctor’s office that will support folks making healthier lifestyle choices. …it is taken from you. For the last two weeks, I’ve been very sick: double ear infection, sinuses stuffed to the max and a persistent cough that keeps me from falling asleep at night. I’ve taken to having a hot steamy shower EVERY night so I can at least calm the cough down. This way, I can fall asleep. I haven’t missed any work, but I don’t feel like hanging out with anyone for fear of getting them sick. I just want to get back to feeling normal again. I ended up back in the doctor’s office again today. Diagnosis: ear infection – still present, lungs – still constricted. Nose – still running. UGH! In a word, I’m miserable! Do we really need a health scare to inspire us to make being healthy more of a priority? In my world, the answer is a resounding YES! Last month, my doctor’s diagnoses of pre-diabetes and this health issue has coerced me to take action. My New Year’s Resolution MUST be to make health a bigger part of my life. I absolutely NEED to get this cough under control, lose some weight again and regain a more fit body. In order to be really healthy, I need to lose at least 40 lbs. But HOW will I do this? How can anyone conquer a goal they may feel is too high to reach? I do not need any incentive to discuss spiritual matters. I guess that’s why the name The Sketchy Scribe fits me so well. And I don’t care what spiritual path you want to discuss. As long as it isn’t being rammed down my throat, I’ll talk about anything spiritual. I also need alone time everyday to reflect on my life and how I’m living up to God’s plan. 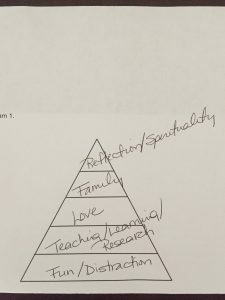 In order to make health a priority however, I need to get health on my pyramid and get it as close to the top as possible. So, I decided that this post would be about how to change priorities. It made me curious, just what do the spiritual masters say about health? How can I change the way I think about health in a way that supports my deep love of spirituality and reflection? How can I create a WIN-WIN situation for my love of spirituality and my need to get healthy. First, I needed to get my mindset in gear. So yesterday, I decided I’d start changing my attitude by going to a health spa. The Grapeseed Spa at the South Coast Winery in Temecula, California is a world class facility with all kinds of body treatments and experiences. I decided I’d sit by the pool, drink lots of water, eat what felt good and was organic. It was kind of interesting to watch all the spa goers walking around in their white robes like they were apart of some healthy religious order. You have to believe you are doing everything you can to become well before you will experience the process of getting well. And that includes getting your head in the game. You cannot follow your heart in these matters. Faithful Christians seem to have a better handle on this “head over heart” thing. They really get the importance of keeping their minds focused upon a certain path. They know that Jesus said “Out of the heart comes evil thoughts, murders, adulteries, fornications, thefts, false witness, slander.” Matthew 15:19. You must therefore guide your heart. Whatever you invest your time, money and energy to – will draw your heart. According to Christian pastors, Stephen and Alex Kendrick and their book, The Love Dare, in order to change your priorities you must do some real work on your heart. You check your heart by paying close attention to your feelings and your actions. Watch yourself for a time. What do you put your time, energy and money into? Is it congruent with the things you say are important to you? You guard your heart by noticing when something unhealthy or unclean tempts you. “Don’t let your heart put money or work above your loved ones,” Proverbs 6:25. Be aware and guard your heart. You set your heart by making a mental shift to find where your heart needs to be and then choosing to go in that direction. Finding this difficult? You’ve probably set your mind in “Follow your heart mode.” You must not “abdicate your mind” to the ocean of your emotions. You can make up your mind to control them. Finally, you invest in your heart. You invest three things: your time, your money and your energy. Spend time doing the thing you know you need to be doing. That’s why I spent the money on the health spa. The more you invest financially in your goal, the more your heart will desire to go there. If you haven’t invested the time into answering the questions for yourself in my last blog post, do it now! It’s a great way to get to know yourself at a deeper level. Whip out a piece of notebook paper and jot down one word answers to the questions. Then check out how many times you answer the same way. My highest priority was reflection/spirituality, but maybe yours is work or being with a loved one. Perhaps that loved one isn’t able to make you the priority that he is to you? Maybe a family situation is making it impossible for you to be with all of the people who matter to you? What can you do when life throws you a curve? You focus on YOUR priorities and CHANGE THE THINGS you have the power to change. Notice, I used my top priority to motivate me to change my mindset. 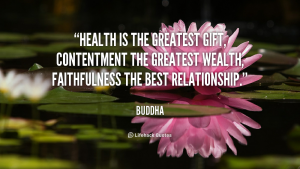 How was health going to be beneficial to my being a spiritual person? Well, I’ll be more available to help my fellow man find their way to God. I’ll live longer so I can continue my spiritual reflections. All of a sudden, getting healthy seems real – well – spiritual. What is your top priority and how can you use it to motivate you to change something in your life? Ask yourself what you wish your pyramid could look like…Try not to compare yourself to someone else though. This isn’t a contest. You can change your priorities in life if you REALLY want to. You CAN create a WIN-WIN situation. It will take a bit of mindfulness and concentration, but if you want it badly enough, anything is possible. Make a plan and make your mind up to do it. Then, keep an eye out for those temptations that will derail you. Also, be on the look out for Win-Win solutions (More on this next week) to solving the little issues that (invariably) come up. My Action Plan for Clean Thinking: I’ll spend MUCH more time in the kitchen preparing clean food. I’ll take lunch to school two times this week. I’ll guard my heart from temptations (like French fries at Del Taco driving home from work). I’m also going to focus on eating more slowly. No more working at lunch time. I’m going to sit and slowly eat my food. I’m going to set myself up to succeed by cleaning all the sugary, fatty food out of my kitchen cupboards. Indeed, one finds a reluctance to focus on exercise, in part because time is so limited and time spent on sport is time not spent on Torah study or hesed (good deeds) activity. Although many of us are familiar with Maimonides‘ long discussions in the Mishneh Torah about the importance of exercise and healthy, measured eating, we rarely take the details of his many recommendations to heart. For example, Maimonides states that a person “should engage one’s body and exert oneself in a sweat-producing task each morning.” Despite Maimonides’ words, this centrality of exercise is simply not part of normative Orthodox Judaism. I invested in a gym membership last year because it became very clear to me, that in the area of physical fitness, I didn’t have a clue what I was doing! I didn’t think I had time for fitness. But after spending $500 on the membership, I knew I had to show up at least five days a week and do the weight training exercises with as much fidelity as possible. I also remember when I was in Fourth Grade, I was a svelte and powerful gymnast. I’d go outside every night and work out on my jungle gym in the backyard. Of course, I had no idea I was working out. I thought I was just out playing with the neighborhood kids and my pesky little sister. I loved how strong and powerful my body was. I miss THAT body. I know I’ll never see that girl’s body again, but I can do at least 15 minutes a day of some kind of activity. We can all find fifteen minutes, right? I wonder how many minutes we actually save NOT doing exercise? The quote above inspires me to want to get up and do some yoga or go for a brisk walk every day. I’ll be sure to move, somehow, for at least fifteen minutes five days a week. Even it it is just doing the vacuuming in my house. I’ll do these exercises with fidelity. It doesn’t matter how many reps you do, just that you do the reps you do CORRECTLY. My Action Plan for Clean Moving: Do yoga or walking in evening after dinner five nights per week. I’ll also spend a few hours on a Saturday this month in fitness room at my club checking out the weight machines and the schedules for yoga and Zumba. In my expensive gym, I learned that true weight loss does not happen at the gym. It happens in the kitchen. You gotta give your body the pure nutritious food it needs to nourish the temple within. I think Nirmala is saying that in Hindu teaching, We are Divinity. We reside in a temple that God created for us to use. This temple, must therefore be pure and come into the light. It should be a place of positivity and favor. It should be clean and clear so God can hang out. Religious Jews are really into the idea of eating food that is clean and kosher. It must first be blessed by a Rabbi. Then, chosen carefully by it’s consumers. They must take this food home and store it properly. Then it must be prepared and eaten by very strict guidelines. Now, I’m not saying I’m going to invest in another refridgerator and another set of pots, pans, plates, cups., etc… What I am saying is that every aspect of food preparation and consumption could be viewed as a religious experience. When I was a child, I loved water. I used to say it was “God’s drink.” and I was always pushing water to any guest that came to our home. Anyway, I’m not sure when my love of water died down. Whenever I’m sick, I remember just how clear and clean water tastes. I remember how satisfying it is. I’m going to drink more water this month. My Action Plan with Clean Eating: Drink water with every meal. I’m going to eat a better breakfast every morning: oatmeal, egg white bites, whole grain toast with peanut butter. I’m going to avoid going through the drive thru as much as possible. Deadline: Sunday, November 12, 2017. I have a doctor’s appointment to look at my blood work. I was diagnosed with pre-diabetes in July. So it’s reversible IF I get on it – now. Hopefully, by November, the blood work will look better. In the mean time, I think I’ll saunter off to the kitchen and make some of these for my breakfast tomorrow… Who needs to buy them at Starbucks when you can make them yourself. Don’t forget to spray your muffin pan first!